The Congress Plaza hotel is very popular for conventions and history buffs. It was built in 1893 to show that Chicago couldn’t be beat down by the 1871 fire. This large hotel has some fantastic views of the lake and the park. It was one of the only hotels I could find that had enough room for all six of us without having to rent a suite or two rooms. 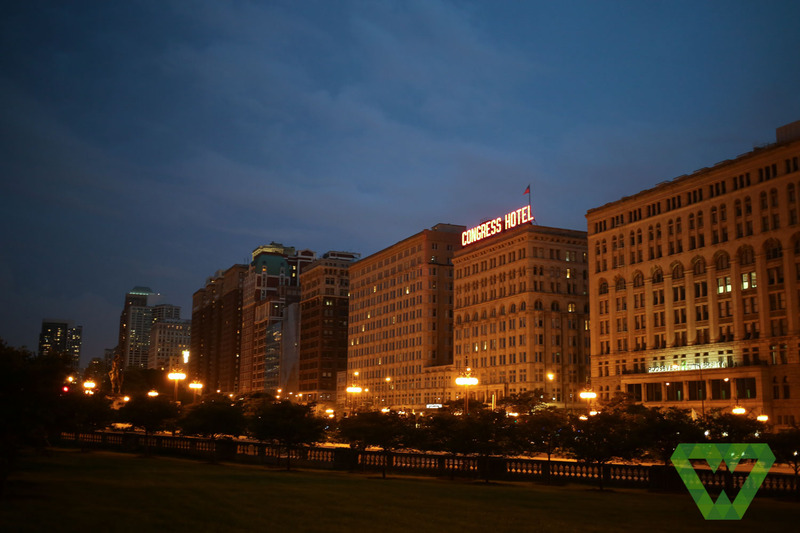 Chicago is not cheap when it comes to hotels. During checkin someone mentioned we should see the main ballroom. We were instructed to ask the security desk for access. The first time we asked the security guards were just finishing their shift change. We were asked to come back in several hours. Later that evening a security guard happily escorted us upstairs to the ballroom and proceeded to give us some fantastic history of this amazing building. This ballroom has been used for several political events. Teddy Roosevelt held a campaign party here while awaiting the final count announcing his win. Allegedly, the famous mobster Al Capone had a money laundering facility in this or adjoining hotel. There were tunnels connecting several of the hotels together so Capone could smuggle and use them for escape. The security guard said the tunnels have sense been bricked over. Other sources say Capone also had a suite on the 8th floor but he never used his name to check into the hotel. The Women’s Suffrage movement held a few events here as well. There are a handful of websites explaining the deaths, suicides, and homicides that have occurred here over the past 200 years (nothing of note in the past 40 years). These incidents have led to many ghost reports and a long history of the hotel being the #1 most haunted hotel in Chicago. I will have to admit that the hotel, while beautiful, does have a somewhat eerie feel to it. The hallways and stairs would be the perfect backdrop to a Hitchcock film. Our security guard/tour guide loved showing us around. He asked if we wanted to see the Florentine Room. Of course we said yes. The kids loved the tour and had fun asking questions about all of the gold leaf in the room. We steered the conversations away from ghosts during our tour. The hotel is in a great location and offers great rates over the weekend as long as there isn’t a convention. Our rooms were old but also clean, spacious, and the staff was a pleasure. I would stay here again.